Will Trump Be a Coolidge Or a Hoover? Donald Trump is going to be the 45th President of the United States, baring the intervention of Fortune and the Angel of Death. He will not be the first businessman to become President (that would be George Washington). He will match Dwight (Ike) Eisenhower in lack of prior experience in political office. No one is sure what his policies will really amount too, which is to say, how much of his campaign was just rhetoric to get votes. The best historic precedents, in my opinion as I look out over the vastness of U.S. history, are Calvin Coolidge and Herbert Hoover. Though almost identical in terms of policy, the former presided over the Roaring Twenties, while the later presided over the first four years of the Great Depression. So in looking at Trump, the mere fact that his policy slant seems to be similar to Hoover and Coolidge, does not mean that we are guaranteed prosperity or doomed to economic disaster. Fortunately, history will not be a replay of 1924 or 1929. The details matter, just as they did in the 1920s, but we can't know which ones will matter most, yet. Let's start with a brief review, a memory refresh about Calvin Coolidge and Herbert Hoover. 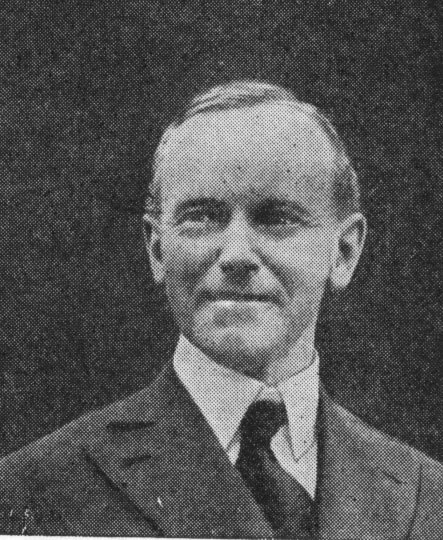 Calvin Coolidge was chosen as the Vice-Presidential running mate of Warren G. Harding at the Republican Convention of 1920. Even though Americans were on the winning side of World War I, which Woodrow Wilson had maneuvered the U.S. into after pledging to keep us out of it, they were tired of the Democratic Party regime. Republicans were in the majority back then, and would be until their fortunes changed in 1930. Coolidge had been governor of Massachusetts, back then a solidly Republican state. Coolidge was somewhat progressive, having signed laws reducing maximum hours of work per week for women and children (a big issue at the time). But he also had appeal for the right wing of the party, having crushed an attempt by Boston police to form a union. He was seen as anti-communist (this was during the first Red Scare) and pro law and order. President Harding died on August 2, 2923. President Coolidge, working with a Republican Congress, signed some conservative, pro-business legislation, including reducing the highest tax rate from 58% to 46%. But they did increase the estate tax. No one cared much, because the economy was strong. In addition Prohibition (of alcohol consumption) had led to more, not less, partying. Employment was strong and the stock market was starting the climb that would become a bubble later in the decade. Coolidge won reelection by a landslide in 1924. Only the racist, segregated states of the South voted against him. When Coolidge left office the economy was strong. Most Americans were clear that free market capitalism beat socialism hands down. Herbert Hoover was a successful business man, a mining consultant and owner. He was also public-spirited. While had had never been elected to office, he had served as director of the U.S. Food Administration during World War I and then as Secretary of Commerce under Harding and Coolidge. Whereas Donald Trump barely won the election of 2016, Herbert Hoover just about swept the country in November 1928. Only the six hardest-core racist states plus Massachusetts and Rhode Island (where Roman Catholic voters dominated) went for his opponent, Al Smith. Hoover won 58% of the popular vote. The Stock Market crash on October 29, 1929 cannot fairly blamed on Herbert Hoover. Nor can the general economic decline, which became almost global (excepting the Soviet Union), known as the Great Depression. Prior to the crash, Hoover's policies did not deviate in any significant way from Coolidge's. The first lesson we can learn from this is that the exact same economic policies can produce different results, depending on the context. What worked fine in 1924 did not work so well in 1930. The debate about what caused the Great Depression is, interestingly enough, rarely accompanied by a debate about what caused the prosperity of the 1920s. Prosperity is the presumed norm, but American economic history prior to 1920 does not support that thesis. In the 1800s the economy was dominated by economic cycles. Over time the economy grew because the population grew (it was one of the great population expansions of world history), and also because industrialization and urbanization grew, but in any given five-year period the economic cycle dominated. The main contrast to the 20th century was the cycles appeared mainly as land booms and busts, with manufacturing and the stock market secondary to that. The Federal Reserve System was created in 1913 to help flatten out the economic cycles, though it was set up primarily to minimize banking panics, rather than to minimize the bubbles that often proceed panics. The Fed seemed to be doing that job well until 1929. After the Great Depression it seemed to do well again (relative to the 1800s) until 2007. Of course the Federal Reserve System is seen as socialist interference by free market ideologues, and as bankers running the government by socialist ideologues. Both are quite happy to put much of the blame for the Great Depression and Great Recession on the Fed. Most of the blame for the Great Depression went to Hoover, even though most of the Great Depression happened under President Franklin D. Roosevelt. This led to a revolution in American politics. The Democratic Party, which had lost the Civil War, became the party of the majority of Americans until the 1970s. So what will happen to Donald Trump? I reason that the economy itself is far more powerful than any American President. It does what it wants to do. What will it do next? The main argument for the Hoover scenario is that we have already had about 8 years of economic expansion (that Barack Obama just happened to be in office to preside over). So we are due for a down cycle. The weak point of that argument is that this economic expansion has brought us back to normal, not to the excess of 1927-28. The stock market is not high. Interest rates are incredibly low, which is fueling a potential housing bubble, but they will probably be raised in 2017. So, not Hoover, not yet, in my judgment. Generally, we are at 1924, the year Coolidge was elected in his own right. The economy seems pretty decent. Trump and free-market Republicans will do a bit of deregulation and a bit of Federal stimulus spending. This may be offset to some extent by the Fed raising interest rates. Based on history and the nature of the kind of people who form the Fed board of governors, I believe the most likely scenario is that the Fed won't raise interest rates fast enough. A bubble will develop, at which time the Fed will either have to kill the entire economy with higher interest rates, or wait for the bubble to burst on its own, which will also kill the economy. The bubble might not be in housing or stocks, though those are traditional areas with bubble tendencies. It could be in wages for working people. If those go high enough, fast enough, it could lead to inflation, and the Fed may shy away from poking at financial bubbles, but they are not likely to shy away from crushing a wage bubble. The bubble could also be in another nation or nations, since the economy is now global. The important thing to remember is that the economy game is too complicated to predict with accuracy all the time. Economists are best at making predictions with about a 3 month horizon. We could be in for two or four or eight years of prosperity, or things could be falling apart as I write, with no one (or almost no one) having noticed it yet. My best guess is that a bubble will develop during the Trump presidency. And he likes bubbles, so he won't do anything about it until it is too late. Neither will the Fed, or Congress, or the ordinary business people and consumers who should have learned a lesson about the folly of buying into bubbles in 2008.